Environmental illness: certain health professionals and clinical ecologists claim it impacts and inhibits 15 percent of the population. Its afflicted are led to believe environmental illness (EI) originates with food, chemicals, and other stimuli in their surroundings -as advocates call for drastic measures to remedy the situation. What if relief proves elusive-and the patient is sent on a course of ongoing, costly and ineffective "treatment"? Several hundred individuals who believed they were suffering from EI have been evaluated or treated by Herman Staudenmayer since the 1970s. Staudenmayer believed the symptoms harming his patients actually had psychophysiological origins-based more in fear of a hostile world than any suspected toxins contained in the environment. 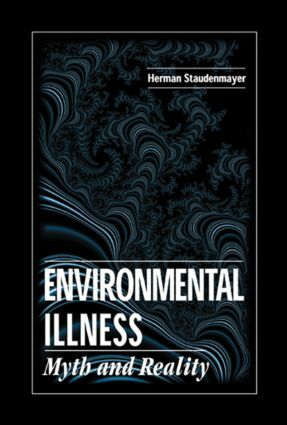 Staudenmayer's years of research, clinical work-and successful care-are now summarized in Environmental Illness: Myth & Reality. Dismissing much of the information that has attempted to defend EI and its culture of victimization, Staudenmayer details the alternative diagnoses and treatments that have helped patients recognize their true conditions-and finally overcome them, often after years of prolonged suffering. "…courageous book in an attempt to investigate and debunk the 'myth of environmental illnesses'…This book is very timely in contributing to this debate." "This is a passionate book. Dr. Staudenmayer is deeply concerned for the welfare of people alleged to suffer from (environmental illness)… He is a true advocate for his patients. His book is worth very serious consideration." "…courageous book…to investigate and debunk the "myth of environmental illness..This book is very timely…"
Foreword by Henry Claman, M.D.